Awwwww. where were you when they made simcity, hm? some aircraft for loading of cars? I may consider it. Perhaps any from the Guppy family. After all, if there's a plane that can carry petrol/gas, why not other that can transport cars? 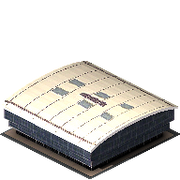 but you'll have to wait until I finish the buildings..
TBT Air Cargo Terminal finished..
EDIT: Hemisphere Terminal finished too. Pavillion Air Cargo Terminal will be ready tomorrow. EDIT: Pavillion Air Cargo terminal finished. See image. EDIT: C5 and a couple of Guppy's finished. There're two versions of Guppy, one for transporting cars and the other piece goods. The C5 only transports cars. Btw, watching the previous image, I've realized that we need a higher control tower, because it seems quite small in relation to the rest of big buildings, so I'll make some higher control towers for cargo terminals. See the Chinook set in action.. Simple, you just need to trick and built a landing strip on a stop tile. Don't you mean a stop tile on a landing strip? And, do you mean my trick from the old forum? Thanks Vivoh, I've been waiting a long time for someone to do this. The one plane that we had was not able to carry anything other than a few crates. GOOD WORK! Ain't Mil Mi-26 better to make, it can lift 8 tons more (Mi-6) and its about 20 years newer and the worlds largest helicopter (Mil Mi-12 is larger but just a demo). Well, I usually try to make sets of objects, if there's enough info about them, so we may say that it's a Mil Mi set that would include several versions of the same model. Imho, It's the best solution to keep everybody happy, isn't it? .. The A300-600ST is already on the list (some from the Beluga familiy too), and I must confess I thought to include the Hughes H-4 Hercules but I was not able to find a good blueprint, and after all it's just a prototype. Many Thanks vilvoh, I've down loded it and will try it shortly. EDIT: Thanks for the screenshot, Edson. I've tried it and I like it. I have two questions. (These are not criticisms) 1. Is it possible to make it slightly larger? it looks a bit like a Dragonfly buzzing around. 2. Would it be difficult to make it behave like a Helicopter? as in vertical take off and landing. Please remember I'm clueless when it comes to programming, so I'm asking out of sheer ignorance.